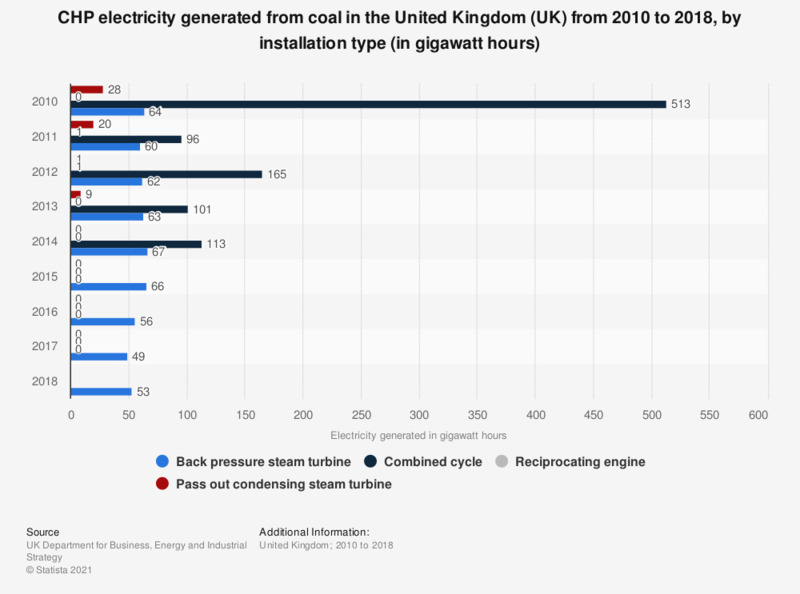 This statistic displays the Combined Heat and Power (CHP) electricity generated from coal in the United Kingdom (UK),by type of installation, from 2010 to 2017, in gigawatt hours. It shows that the amount of electricity generated through pass out condensing steam turbines decreased significantly in 2013, totaling nine gigawatt hour compared to 28 gigawatt hours in 2010. In 2017, back pressure steam turbines was the only installation type to contribute to CHP electricity generation. *Combined Heat and Power, also known as cogeneration. Gas turbines produced no electricity from coal and have therefore been left out of this statistic. Data for 2010 were taken from a previous report. Statistics on "Coal industry in the United Kingdom"